On the narrative game front (role-playing games, story games, and live-action role-playing), I played 21 or 75% of my titles, compared to 32 in 2015, 21 in 2016, and 26 in 2017. Of these 21 games, I ran 7, or 33%: At the Stroke of Midnight, Blue Rose RPG, Fate of the Inquisitor, Misspent Youth, The Quiet Year, Threadbare RPG, and Turn. Some 13 of these different games (46%) were new to me, I had never played them before 2018. And of these new games, 7 were playtests (43% of the new games or 25% of the year’s total.) Some 13 (46%) included at least person who was not a cis man among the designers (Avery Alder, Meguey Baker, Whitney “Strix” Beltrán, Stephanie Bryant, Misha Bushyager, Ash Cheshire, Carrie Harris, Bryanna Hitchcock, Marissa Kelly, Anna Kreider, Catherine Ramen, Sarah Richardson, Brie Sheldon, April Walsh, and myself) ; I remain unable to properly track other minority types. Like last year, at conventions I ran only games that included designers who were not cis men, in an effort to get them better known. Among the 15 games I had played before, the average rating was 4.2 — there is a reason they were repeat games. Among the 13 new games, the average was 4.0; my favourite new games were Threadbare RPG, Pandemic Legacy: Season 1, and Dream Askew; and I did not end up playing warranting anything less than a 3. Another good year in new games. I played with a total of 85 different people, 54 of which were new to me (64%), up from 89 people in 2017 (44 of which were new to me), and 46 different people (with 21 new) in 2016. It looks like my continued efforts to meet new gamers are working, particularly at Big Bad Con. Of these 85 people, 41 (48%) identified as women, trans men, or enbys, compared to 31 or 39% in 2017 and 23 or 50% in 2016, so somewhere in my usual range. Only 3 or 3.5%, however, presented as persons of colour, compared to 8 or 10% in 2017 and 1 or 0.5% in 2016. I am disappointed by this poor result. Six (19%) of the people I played with were under 18, compared to 7 in 2017 and only one in 2016. 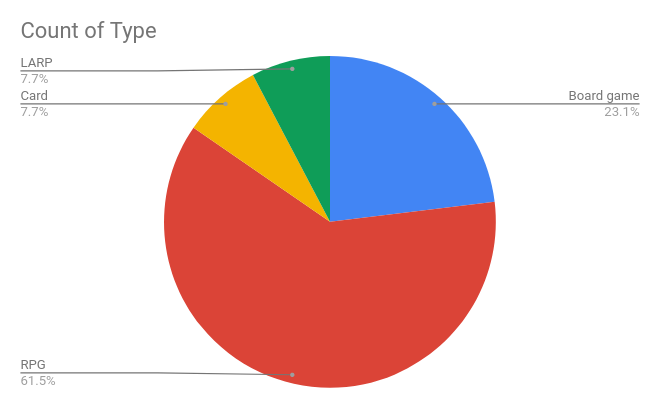 In short, I’m doing well in meeting new gamers and in gender balance; I don’t have a way to track disabilities (since so many are invisible) or orientation but anecdotal data, i.e., visible disabilities and the info some players volunteered suggest the gamers I played with were diverse in these respects as well. But once again I am disappointed in the whiteness of my game table compared to the gamers I know online and to the general population where I live. The party just survived a tunnel collapse and now faces brood brothers. Posted on January 3, 2019 January 5, 2019 by mechanteanemonePosted in games, rpgsTagged BigBadCon, board games, card games, friends, games, KublaCon, rpgs, statistics, tabletop.